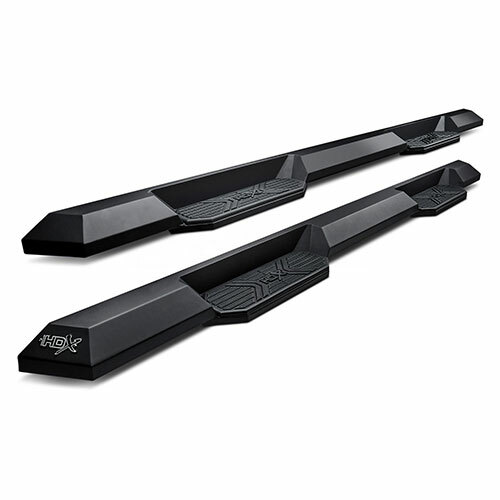 Shop HDX Steps & Boards , E-Series 3" , Sure Grip Running Boards , Pro Traxx 4" 5" & 6"Oval Steps , GenX® Oval Tube Drop Steps , Thrasher Boards , R7 Running Boards , Shop All Side Steps , and back to Westin or Shop By Brand. Westin's NEW HDX Drop Steps provide the rugged look and function that truck owners need and want. They feature a solid 1-piece steel construction and heavy duty punch plates creating high traction step areas. The HDX Drop Steps also feature Westin's notched bar design which allows for more than 2 inches of additional toe/heel placement over its competitors. Available in a textured black finish that complements Westin HDX Bumpers. The HDX Drop Steps have vehicle specific applications and include a vehicle specific mount kit, installation hardware and instructions.